VND21,234 billion (about US$935 million) will be needed to extend Metro Line No.1 in HCMC to the neighboring provinces of Binh Duong and Dong Nai, according to a research team of the Japanese Ministry of Economy, Trade and Industry. In late April, Binh Duong’s government worked with the team on phase 1 of the project to extend Metro Line No.1, which now connects the Ben Thanh Market in District 1 and the Suoi Tien Park in District 9, HCMC. The Japanese research team proposed dividing the extension project into three components: a two-kilometer section from Suoi Tien station to Nut Giao station, a six-kilometer section from Nut Giao station to Di An Town of Binh Duong Province and a stretch of about eight kilometers from Nut Giao station to Bien Hoa City of Dong Nai Province. the first phase while in the second phase, the metro line will be extended from Nut Giao station to Binh Duong and Dong Nai provinces. The total cost of the extension is estimated at VND21,234 billion, with VND2,315 billion of it for the first phase and VND18,919 billion for the second phase. According to the research team, the early implementation of phase 1 could help save the construction cost of the two-kilometer extended section, minimize the impact on the operation of Metro Line No.1 and develop a public transit system around Nut Giao station. Tran Thanh Liem, vice chairman of Binh Duong Province, threw his weight behind the proposal for the first phase of the Metro Line No.1 extension. HCMC will cover the investment cost while Binh Duong and Dong Nai provinces will pay the compensation cost. Binh Duong government has asked the research team to submit the design of Nut Giao station to the Ministry of Transport and HCMC. Where funding for the extension comes from is still unknown. Dong Nai authorities said the metro line extension will reduce private vehicle traffic entering HCMC, helping reduce congestion in the eastern gateway of the city. 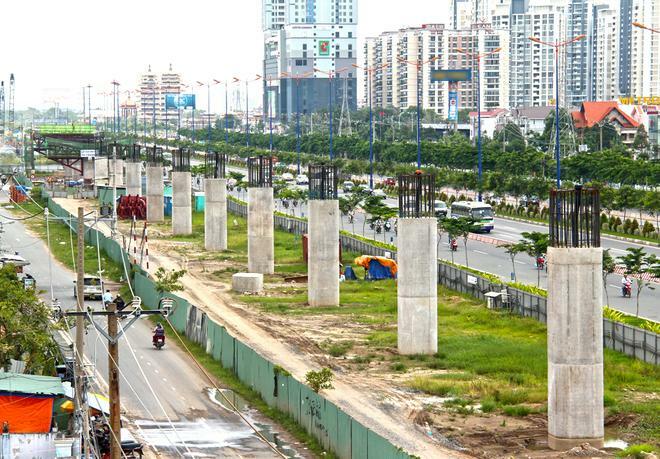 Binh Duong is mulling building a metro line linking Binh Duong New City and Suoi Tien station of Metro Line No.1 to connect Binh Duong’s new center and HCMC. Speaking to the Daily, Le Nguyen Minh Quang, head of the HCMC Management Authority for Urban Railways (MAUR), said the city would need an estimated VND5.2 trillion (about US$289 million) for the development of the Metro Line No. 1 this year but ODA capital to be allocated by the Ministry of Planning and Investment would total only VND2.9 trillion. Due to the slow ODA disbursement for the project, as of April 26, the city had owed the contractors VND1.34 trillion (about US$58.9 million). Quang said if the city continued delaying payments for the contractors, they might suspend construction work, which will make the project fall behind schedule. Both underground and elevated sections of Metro Line No.1 are under construction. Viaducts of the 17-kilometer-long elevated track from Ba Son station in District 1 to Long Binh station in District 9 have been installed. The entire metro line is scheduled for completion and operation in 2020.